I DON’T USUALLY make two posts in one day, but this is a special day. As you know I’ve been doing illustrations for a new edition of Buffalo Castle, the first of the solitaire adventures written for Tunnels & Trolls. 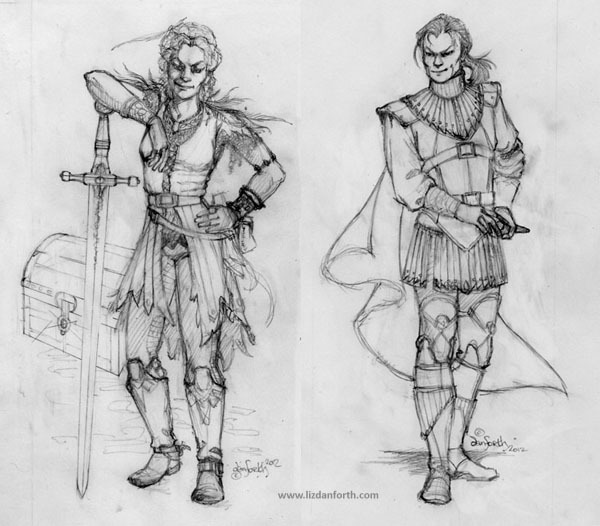 When I offered people the chance to be included in the book, pictured as some of the non-player characters your adventurers would encounter, husband and wife Knick and Tina Moschella opted to appear as the leather-clad bandit and the big strong fighter. Today is Tina’s birthday, and this post is her birthday present from Knick. I have not gotten the pictures inked yet, in case you couldn’t tell. It been a little hectic around these parts lately, or…. Ooops! I think I should have said “I’m just saving the best for last.” Right. That. While I have your attention on the subject of the new French edition of T&T and its associated game books, let me direct you to Patrice’s new website. You can get all the latest news about his upcoming releases with links to where to buy the books (and of course I hope you will!) — at least as long as you can read French. This entry was posted on Wednesday, March 21st, 2012 at 6:20 pm	and is filed under Art, Connectiveness, Gaming. You can follow any responses to this entry through the RSS 2.0 feed. Both comments and pings are currently closed. Thank you so much Liz! I feel so honored that you would post about me! Thanks, Liz! You’ve helped make it a very special day indeed. Wow! Your work continues to get better every year – and you were, even in 1979, my favorite RPG artist. Continue this way, and put out a portfolio or prints sometime soon. Please? I’ve been a fan of yours since I was less than 6’2″ Always loved your art (and no, I’m neither asking for free stuff or a date). What an honor to finally get to e-mail you! I love to see you doing game work again! Those are great, Liz! And hey, happy birthday, Tina! When I do an art book (not if, WHEN), you’ll probably hear about it here first. I had hoped to do is for last year’s holiday season … maybe sooner than that, this year? Artbook! Oh yeah! Can I get a WOOT?